Farming and agriculture was an important part of their society. The Indus River was able to provide the people with water and fertile land, making farming the obvious choice. They grew wheat and barley as their primary crops, but in addition to those few, rye, peas, cotton, and rice were also grown. On top of all that, they domesticated a number of wild animals, such as dogs, cats, zebu or the humped cattle, short-horns, buffaloes, and possibly pigs which was an important tool for cultivation and also another food source. Later, horses and camels were used for transportation too. Although, their society was mostly based on farming, there was evidence of fishing around the area also. They used barbed hooks, lines, and nets much like how we still do it today. Have you used a hammer or knife lately? Well those are two tools that the civilians also had available to them along with spears and arrowheads. However, tools and weapons were made out of bronze and stone. Archaeologists have found that carts and boats were used as the main method of trade and travel. 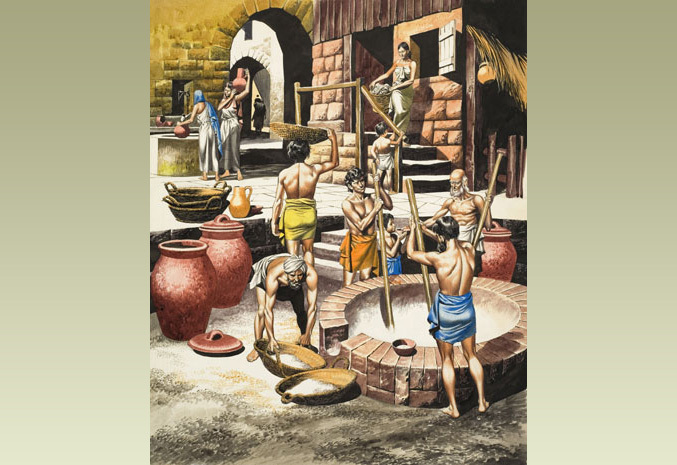 The civilians were not limited to just trading with each other within the civilization, their trade networks encompassed a vast area of land; they traded with Mesopotamia, Central Asia, and the Arabian Gulf region which also expanded their culture. 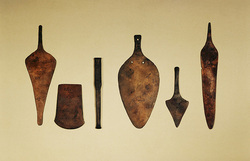 Copper weapons found by archaeologists during the Indus River Valley Civilization. A picture illustrating only a few of the many jobs that were done by the civilians.